CarGurus has 82,211 nationwide Grand Cherokee listings starting at $1,600. Just A Great Vehicle by J.M. An available V8 engine, as well as an upscale interior, a ferocious off-road appetite, plenty of cabin storage, well-mannered on-road performance and the potent new SRT8 trim ensure that Jeep’s 2012 Grand Cherokee remains one scary-good SUV. Unfortunately, limited cargo space, disappointing V8 gas mileage, a finicky navigation system and a dated 5-speed automatic, as well as the potential for sticker shock, might deter a tire kicker or two. Want to drive just about anywhere in style and comfort? Get a 2012 Jeep Grand Cherokee. After a total reworking in 2011, this rugged-yet-comfortable commuter car and rock-climbing family adventure-mobile most emphatically is not your father’s Jeep. Memo to Michael Manley, the head Jeep guy: You’ve brought the Grand Cherokee a long way, baby. The next-gen 2012 Grand Cherokee midsize SUV is a natural progression of the 2011's complete redesign and is fast becoming an institution on U.S. roadways. And why shouldn’t it? This 5-passenger ute boasts nearly everything the modern family wants in an automobile: toughness, practicality, good looks, passenger and (barely adequate) cargo room, surprisingly capable driving characteristics and the traditional option of go-anywhere… and that means anywhere!… 4-wheel-drive capability. 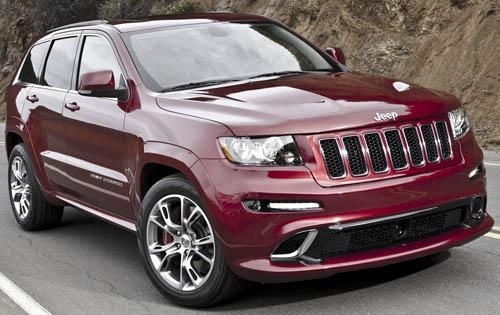 But never fear, the latest edition of the Grand Cherokee still looks like a Jeep. Planted on Mercedes-Benz’s M-Class chassis, this latest Grand Cherokee incarnation sports slightly better mileage numbers from its standard V6 powerplant, electro-hydraulic power steering and a 6-speed automatic transmission in the available V8-powered trims. 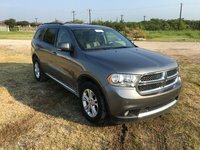 Of course, the three classics, the Laredo, Limited and Overland, are all reprised, while the sumptuous Overland Summit sub-trim and the outrageously performance-oriented SRT8 have been added for the 2012 model year. Yep, gone are the days when chintzy sheet metal and low-rent interiors nearly brought this war baby to its knees. Today’s Grand Cherokee is back to fighting trim and can hold its head high amidst the likes of Toyota’s 4Runner and VW’s Touareg, as well as Ford’s Edge and Explorer one-two punch. Heck, the new Grand Cherokee SRT8 has so much going for it in looks, power and off-road ability that it stands essentially in a class by itself. 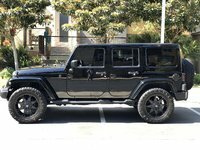 If there’s a weakness in this otherwise well-wrought Jeep, it might be the smallish 68.7 cubic feet of total cargo area, though a fairly spacious, 31.5 cubic foot cavern behind the rear seats provides more than enough room for luggage and/or groceries. Face it, a wealth of standard amenities, a trio of potent powerplants, comfortable, pleasantly appointed cabins, uncanny off-road performance and a dazzling, though often confusing selection of options make this downright posh ute a solid family automobile. Once again Jeep’s Grand Cherokee Laredo, Limited and Overland trims come endowed with the standard ethanol-capable (FFV) 3.6-liter V6 engine and 5-speed shiftable automatic transmission. Look for 290 hp at 6,400 rpm and 260 lb-ft of torque at 4,800 rpm from this peppy six-banger, while the 5-speed automatic boasts hill-start assist and, in Overland and Overland Summit trims, standard descent control. With variable valve timing (VVT), V6-equipped Grand Cherokee trims are good for an estimated 17 mpg city/23 highway with rear-wheel drive, while four-wheel-drive (4WD) editions boast mileage estimates of 16/23. Finally, carrying the proper equipment, those trims equipped with the six-banger can tow up to 5,000 pounds of trailer. The VVT 5.7-liter V8 powerplant that’s available to the three more prosaic Grand Cherokee trims flaunts 360 hp at 5,150 rpm and 390 lb-ft of torque at 4,250 rpm. It also mates with the new 6-speed shiftable automatic for mileage estimates of 16/20 in RWD-equipped trims and 13/20 in 4WD editions. Towing, when properly equipped, is maxed out at 7,400 pounds. For 2012, the just-introduced Grand Cherokee SRT8 rules the road with a 6.4-liter V8 engine that mates with a 5-speed shiftable automatic transmission for 470 hp at 6,000 rpm and 465 lb-ft of torque at 4,300 rpm. When properly equipped, the SRT8 can tow up to 7,400 pounds, but be advised that it’s designed for galloping, not plodding. Alas, mileage is a dismal 12/18 under the best of circumstances. The 4-wheel-drive system available in the several variants of the Grand Cherokee depend on the actual trim selected. Quadra-Trac I comes standard in the 4WD-equipped Laredo and is essentially full-time all-wheel drive (AWD). The Limited, Overland and Overland Summit variations are delivered with standard Quadra-Trac II 4WD that boasts electronic hi-lo gear selection and auto-locking hubs. Additionally, when slippage is detected, traction is instantly diverted to the axle with the most grab. The Quadra-Trac II transfer case can be added to the Laredo with the optional X Package. As well, the Select Terrain system, with 5 dial-in terrain and surface settings can be added to the Quadra-Trac II 4WD variation for an unparalleled off-road experience. Meanwhile, each Overland and Overland Summit with the 5.7-liter V8 sports the standard Quadra Drive II 4WD system with standard limited-slip rear differential. With this part-time AWD setup, torque is automatically switched from the wheels that slip to the wheels that grip. Finally, the SRT8, as befits its muscular status, comes with standard Quadra-Trac on-demand 4WD with electronic hi-lo gear selection and auto-locking hubs, as well as the standard terrain-busting Selec-Trac terrain management technology. Tests had a V6-equipped Grand Cherokee Overland going from 0-60 in a somewhat pokey 9.0 seconds, while an Overland with the 5.7-liter V8 scooted from 0-60 in a somewhat better 8.2 seconds. As befits its beefed-up powerplant, the SRT8 was clocked at an astounding 5.2 seconds from 0-60. Reviewers generally concede that the V6 does an adequate job merging and passing, but that it doesn’t feel quite as quick as similarly powered rivals. Its companion 5-speed automatic was lauded as smooth and relatively glitch-free, though there are those who feel it to be a bit past its prime. Of course, V8-equipped Grand Cherokee trims drew praise from reviewers for their hefty reserves of power that stand ready for any driving situation, while the 6-speed garners kudos for its seamless shifting and willing efforts toward economizing on gas. Refinement in all engines rivals all comers, say most reviewers, with the 5.7-liter V8 drawing especial praise for its confident rumble when under way. Despite its reputation as a fearsome off-road beast, the 2012 Grand Cherokee displays some remarkably sophisticated on-road manners as well, at least according to most reviews. Its 4-wheel independent suspension is bolstered by a short and long arm front end and multi-link rear, not to mention stabilizers fore and aft. The base Laredo sports 17-inch alloy wheels, the Limited comes with 18-inch alloy wheels, and the Overland and SRT8 trims each boast 20-inch alloy wheels. RWD trims roll on standard all-season radials, while 4WD trims are delivered with all-terrain tires. Reviewers are generally impressed with the ride capabilities in the Grand Cherokee lineup, considering its awesome off-road ability. Bumps and humps are handled with reasonable aplomb, while this revamped Jeep’s solid chassis works to help smooth out the drive. Alas, some wallowing and rocking are noted in several reviews, but this is, after all, an affordable sport ute, not a Bentley. Meantime, most reviewers find surprising similarity in ride comfort among the 4 trims, despite the difference in wheel sizes. With its new-for-2011 electro-hydraulic power steering system, Jeep’s rugged SUV demonstrates a nearly perfect delivery of proper feel in the wheel, according to most reviews. Body lean is usually described as well controlled, though some caution ought to be exercised in fast turns. Additionally, the Quadra-Lift system available to the 4WD Limited and standard on the 4WD Overland variations allows driver selection of ride height; lowering the height will put a little more pizzazz in the commute, while raising it allows worry-free rock crawling. Brakes on the 2012 Grand Cherokee are lauded by the vast majority of reviewers as strong and true, with virtually no pedal issues. In testing an Overland V6 came to a stop from 60 mph in a respectable 125 feet, while the SRT8, equipped with standard state-of-the-art Brembo brakes came to a controlled stop from 60 mph in an impressive 112 feet. Finally, the SRT8 sports a standard adaptive damping suspension in which driver-selectable terrain modes interact with throttle, suspension, transmission, traction control and cylinder deactivation systems to provide optional grip and acceleration performance on road or track. Additionally, the adaptive suspension boasts an automatic load-leveling feature for a balanced ride no matter what’s being toted or towed. As the automaker that tries harder, Jeep has put its 2012 Grand Cherokee nearly on a par with luxury sport utes costing thousands more, in both exterior and interior features. The base Laredo trim, for instance, boasts a rear spoiler and heated power-adjustable mirrors outside, with cloth upholstery, an 8-way power-adjustable driver’s seat, a fold-flat front passenger seat and reclining rear seats on the inside. Remote power door locks and power windows are complemented by cruise control and telescoping tilt-wheel steering, with dual-zone air conditioning, a leather-wrapped steering wheel and floor mats front and rear adding more than just a little class to the whole ensemble. And for entertainment, there’s a 66-watt stereo that stars an MP3-capable single-CD player (with basic Uconnect 130 formatting) and 6 speakers. Stepping up to the Limited, tire kickers will find such added touches as a roof rack and power sunroof, heated power-adjustable front seats and premium leather upholstery—but no fold-flat front passenger seat. There are, however, such old standbys as remote engine start, a universal remote garage door opener and rear parking sensors, all bolstered by dual-zone climate control and memory for driver's settings. Simulated wood and chrome dash trim is complemented by alloy and leather embracing the center console, while the entire cabin is bathed in sound from the 506-watt audio system that includes Uconnect voice activation and music display on a dash-mounted display, a single-CD player, satellite radio, a 40GB hard drive and satellite radio. Finally, the Limited is also delivered with a standard hard-drive-based Garmin navigation suite, also under the tutelage of the Uconnect system. The high-end Overland comes with a standard rear glass sunroof, power rear liftgate, upgraded leather upholstery and a Class IV trailer hitch and wiring. Height-adjustable front seats make things a bit clearer for driver and passenger, while power-adjustable pedals make life on the road much more comfortable, and upgraded cabin trim accents will sooth the senses. For the Grand Cherokee Overland Summit sub-trim, toss in unique 20-inch polished alloy wheels, upgraded exterior and interior accents, including upgraded leather upholstery and posh carpeted floor mats. Finally, both the 4WD Overland and its 4WD Summit kinsman sport the height adjustable Quadra-Lift air suspension system for added handling abilities on-road and off. The heady SRT8 deletes the sunroof and power liftgate in favor of color-keyed exterior accoutrements, LED running lights, performance-tuned steering and a handy adaptive air suspension. It also adds a standard electronic limited-slip rear differential, paddle shifters, leather and suede sport front seats, and carbon-fiber cabin accents. Options in the lower trims include an abundance of those features found standard on the high-end editions, while all RWD trims can be equipped with available all-terrain tires, tow hooks and a full-size spare. Trims equipped with available 4WD are eligible for a couple of Off-Road Adventure packages, including skid plates, a telescoping rear driveshaft and added coolant capacities, while the Limited and Overland trims with either drivetrain can be delivered with a power-adjustable heated steering wheel, rear-seat DVD entertainment and ventilated front seats. Finally, Overland trims can be purchased with the 5-mode Selec-Terrain transmission, differential, chassis and powerplant management system, and Quadra-Lift ride-height adjustment. Reviewers are quite pleased with the way Jeep has stoked its Grand Cherokee lineup with amenities. Seats are described as comfortable and supportive, cabin workmanship and materials as surprisingly upscale. Gauges, along with most controls, are noted to be large, legible and well-located, though a few grumble that the Garmin navigation suite sports somewhat undersize buttons on the display screen and a tendency to complicate audio functions a bit. Entry and exit are fairly easy, though, considering this ute’s ride height, while cabin storage is a bit more accommodating than the comparatively small cargo area, according to most reviewers. Touted as a rugged, go-anywhere family SUV, the 2012 Grand Cherokee must eventually find itself on crowded highways; thus it boasts a plethora of state-of-the-art safety equipment. All trims come with 4-wheel antilock brakes (ABS), electronic brakeforce distribution and emergency braking assist, as well as traction and stability control. Inside, front and rear head airbags are complemented by dual front side-mounted airbags and active front headrests. Also delivered across the lineup are standard front fog/driving lights, dusk-sensing headlights, a post-collision safety system and brake drying. The Limited, Overland and SRT8 additionally boast standard daytime running lights, self-leveling xenon high-intensity-discharge (HID) headlights, turn-signal-integrated mirrors and a remote antitheft alarm. The SRT8, meantime, also flaunts standard emergency braking preparation. Finally, the Overland Summit sub-trim sports a standard blind-spot warning system, radar-interfaced adaptive cruise control with forward collision alert, and a rear cross-path warning system, all of which are available to the regular Overland edition. As a Top Safety Pick for 2012 by the Insurance Institute for Highway Safety (IIHS), Jeep’s competent Grand Cherokee gets a top-notch score of Good in all four of the Institute’s testing criteria, including front and side impact, roof strength and rear passenger protection. The National Highway Transportation Safety Administration (NHTSA), on the other hand, gives this capable ute its second highest award of 4 stars for overall safety. Front impact and rollover tests garner 4 stars from the government testing agency, while side impact tests result in the Administration’s highest score of 5 stars. A number of owners complain that the 2012 Grand Cherokee ought to deep-six the old-timey 5-speed automatic, which is implicated in some uneven shifting both on the highway and in downtown traffic. The pesky navigation suite, with its tiny buttons and disturbing habit of overcomplicating audio functions, is a downer for a few owners, as are the lack of both standard (or even available) side steps and roof-rack side rails. Despite claims of adequate comfort by reviewers, seats are described by a few owners as a bit too firm, while gas mileage in both V8 powerplants is noted by nearly all as less than frugal, at best. On the plus side, owners are almost unanimous in their praise of this tough ute’s off-road capability, its V6 pep and mileage, and the surprisingly well-wrought cabin. A number of owners concur with reviewers the pavement-born ride comfort is better than expected, while virtually all owners agree that this gentle brute has what it takes to provide a safe and secure driving environment. Summing up, the consensus of those fortunate enough to own the next-gen Grand Cherokee is that this heady SUV represents the epitome of style, rugged practicality and value. What's your take on the 2012 Jeep Grand Cherokee? hemiar I've owned my 2012 Jeep Grand Cherokee, Overland, Hemi -V8 for about 1 year now. I love the Jeep, it's luxurious look and feel is great considering the other luxury SUV lines. It's got great traction for us on the winter seasons [East Coast] and feels sturdy and effortless on the road, turns, hills, wet and snow roads, etc. I would prefer for it to default to Sport mode but enjoy the fact that it automatically, when in auto mode, turns off cylinders to try an save some gas. I have been considering trading mine in for a Hybrid auto but seem to find it difficult to let go lol. Users ranked 2012 Jeep Grand Cherokee against other cars which they drove/owned. Each ranking was based on 9 categories. Here is the summary of top rankings. Have you driven a 2012 Jeep Grand Cherokee?